The most reliable, all-in-one video production system that’s small in size and big on pro features. 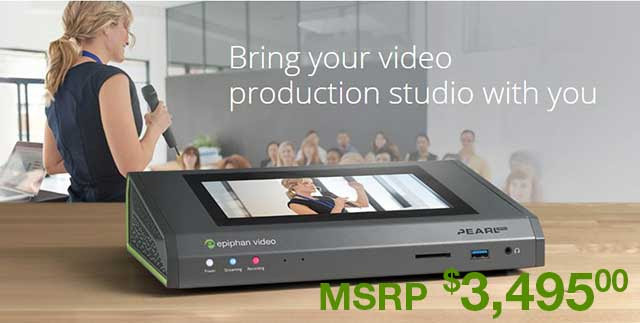 Record, stream, and switch up to 2 HD inputs simultaneously and take your video production to the next level with Epiphan Pearl Mini™. Modular Expansion for Ninja V for wireless timecode, genlock and Bluetooth control with exchange battery power life functionality. The AtomX Sync module brings professional wireless timecode and sync plus Bluetooth control to Ninja V, perfect for enhancing DSLRs, mirrorless cameras or game recordings. You can sync and/or control literally thousands of Ninja V units equipped with AtomX Sync modules on the same network at ranges of up to 300m. Multi-cam shoots have never been so easy. AtomX modules bring broadcast level standards to any HDMI camera or source, making it easy to integrate large sensor consumer cameras easily into traditional live productions. 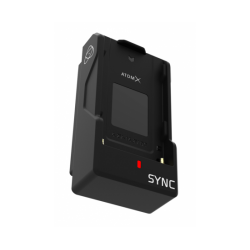 AtomX Sync has a built-in battery extender that allows for continuous power when swapping batteries, ensuring uninterrupted operation of the Ninja V during a shoot. Introducing the most flexible ecosystem in Pro Video - AtomX Modularity is at the heart of the Ninja V with a bi-directional high speed expansion port breaking out connectivity for I/O of video, audio and power. Atomos created AtomX to ensure users could adapt and connect to any legacy or future wireless or wired video standard. 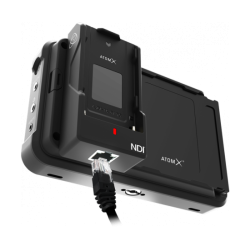 The expansion system offers endless scalability and is demonstrated by the first of many modules - the AtomX Ethernet/NDI® at $199 and the AtomX Sync at $149. Class leading technology partnerships For Timecode systems the most basic use case is to sync a mirrorless camera to an appropriately equipped audio device for perfect automated sync sound – a huge benefit for anyone from vloggers through to broadcasters and Hollywood productions. 5.5-inch 1080p OLED with Wide Color Gamut and Tilt Arm. Professional grade camera-top monitor that can power your DSLR or mirrorless camera. 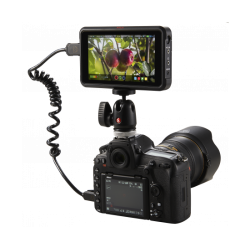 Ninja V is a small form factor, 1” thick 5” monitor recorder that offers amazing features to DSLR/Cinema users. Record up to 4Kp60 10-bit HDR video direct from your camera's sensor, over HDMI 2.0. Store edit-ready ProRes or DNxHR on affordable SSD drives and bypass your cameras internal compression and record time limits. 1TB will give you 2.5hrs 4K on tiny AtomX SSDmini The stunningly bright 5.2-inch 10-bit HDR monitor has an astounding 1,000 nits of output. It’s a sleek 1” (2.5cm) aluminium body, is crafted for maximum durability, weighs in at just 11oz (320g), and attaches to any camera rig easily. The Ninja screen displays a stunning 10+ stops of dynamic range in realtime from Log/ PQ/HLG signals. Clearly see your images in daylight on the near edge-to-edge anti-reflection screen. The display can be calibrated for perfect color accuracy every time, with playout to HDR or SDR TV sets. 4kp60 or HDp240 Game Recording just became fun and simple from any HDMI gaming unit. Place the Ninja V in-between your unit and the TV, and record for hours to off-the-shelf SSD drives. Auto HDR flags mean perfect TV set up every time! Show off your skills or check your game development on the most stunning video recorder ever built! AtomOS gives simple tools for accurate set up and one-touch operation ensuring a great record each take. Recording isn't complete until checked. AtomOS gives speedy playback, slow motion and frame by frame analysis for instant review. Any production large or small needs high quality viewing. Even if you aren’t recording, the Ninja V is the best monitor available today. Audio can be input directly from the camera digitally via HDMI, or fed in analogue via a stereo 3.5mm line/mic socket – especially useful for cameras that do not have a mic input. NewBlue, Inc. delivers a system of unique, interconnected technologies designed to empower video creation, editing, and sharing for consumers, professionals, and businesses. Founded in 2006, the company offers more than 250 audio and video filters, tools, and transitions distributed under its NewBlueFX brand, which integrate with the industry's top non-linear editors, including Adobe Premiere Pro, Apple Final Cut Pro, Avid Media Composer, Corel Video Studio Pro, Grass Valley EDIUS, and Sony Vegas Pro. The NewBlue Video Cloud encompasses these technologies in a cloud-based, scalable patent-pending video production engine. This technology automates video production across a broad range of uses, powers the company's mobile and browser-based video creation tools, including Vibop, and is available for license. Titler Live 4 Present streamlines your live production workflows with on-air graphics driven from spreadsheets. Use your existing graphics from Adobe â“‡ Photoshop â“‡ or customize included designs in the Title Designer interface. Get started quickly and connect your graphics to Excel â“‡ spreadsheets, CSV files, RSS feeds and more to prepare dynamic main titles, lower thirds, bugs, clocks and crawls for your live productions. Simply integrate with leading streaming solutions to deliver 3D animated graphics for presentations, lectures, house of worship services or other live events using 1 channel of NDI â“‡ or SDI key and fill. 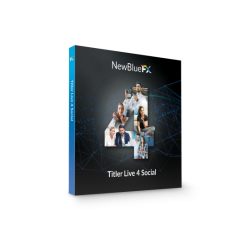 Titler Live 4 Social instantly brings your show to the next level with live audience comments, tweets and Facebook polling. Quickly connect to live videos on your Facebook, Twitter and YouTube pages to engage your audience with stunning 3D animated social graphics. Combine all your social media feeds into one to save time and easily manage your show on the fly. Choose from fresh, ready-to-use designs for social comments, polling, main titles and lower thirds in the Title Designer or easily bring in your own graphics from Adobe â“‡ Photoshop â“‡. Work with leading streaming solutions to deliver 3D animated graphics that will enhance your live shows using 1 channel of NDI â“‡ or SDI key & fill. Titler Live 4 Sport delivers dynamic scoreboard graphics. Leverage scoreboard connectivity and included controllers to streamline your workflows and instantly elevate your sports broadcasts. Use your team’s existing graphics from Adobe â“‡ Photoshop â“‡ or customize included sports designs in the Title Designer interface. Quickly connect to scoreboard data from Daktronics â“‡ (via NewTek DataLink), Stat Crew â“‡ or Sportzcast to drive scores for baseball, basketball, football, hockey, soccer, tennis, volleyball and more. Integrate with leading streaming solutions to deliver 3D animated graphics for all your games using 1 channel of NDI â“‡ or SDI key & fill. Dial in the right look with a range of powerful controls. Easily customize color, shape, angle, lighting and more . In addition to Titler Pro 5 Ultimate, TotalFX delivers NewBlueFX's full line of video effects and transitions. 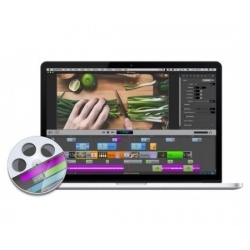 Create stunning videos with ScreenFlow the award-winning & easy-to-use video editing & screen recording software for Mac. 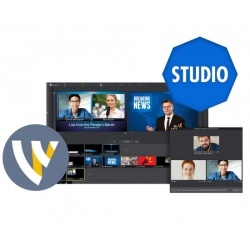 Includes built-in stock media library, powerful editing tools and more all in an easy to use and easy to learn interface allowing you to create amazing content in just minutes.